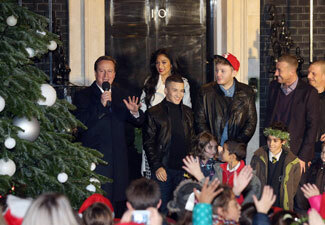 The X Factor finalists and Nicole Scherzinger joined David Cameron in Downing Street last night. The three finalists, Christopher Maloney, James Arthur and Jahmene Douglas sang Silent Night to the crowd as the 20ft fir tree’s lights were switched on. Following the ceremony, Christopher tweeted: ‘Just turned on the lights at Downing St to raise awareness and help for a charity or kids who only live short lives. So humbled’. All three finalists will be visiting their hometowns in the lead up to Saturday’s X Factor final. Who is your favourite to win this weekend?